MAF participants get the latest information on the new MAF page. New PLE's coming August 1. Be sure to check them out and register. Find resources to help you engage learners, allowing them to make sense of mathematics and develop problem solving skills. The KCM is now inviting applications and nominations for a mathematician or mathematics educator to join us as Executive Director. 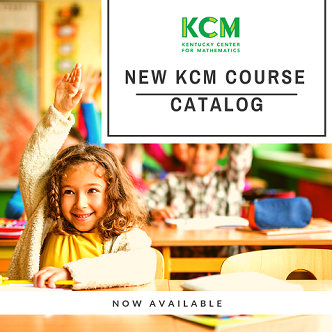 The first installment of the 2019-2020 KCM Course Catalog is now available! More course offerings will be added over the next few weeks. NOTE: The link for Explorations in 3rd Grade Multiplication and Division in the above PDF was updated at 9:20 a.m. on April 15th. If you downloaded a copy before this time and you are interested in this course, please download it again or use the link on one of the available offerings pages above or on the Calendar. 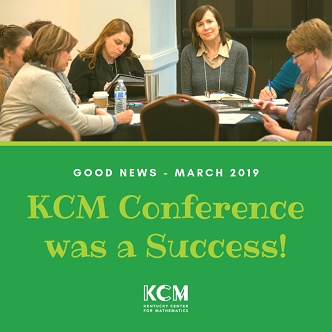 Over 500 math educators from across the commonwealth came together March 11th and 12th, 2019 for the eleventh annual KCM conference, titled Connect: Fostering Mathematical Minds and Communities. Six featured speakers from across the US and Canada and over 70 Kentucky educators shared their mathematics education knowledge with attendees in 79 breakout sessions. One conference attendee asserted, "I always come away with new ideas and a freah motivation to keep moving my students forward in mathematics!" The Kentucky Center for Mathematics is pleased to present our 2018 annual report! 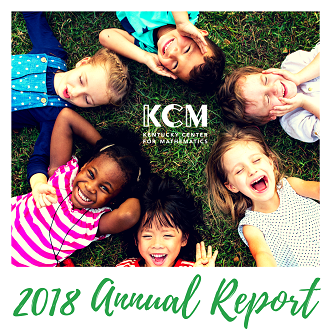 This year’s annual report highlights the statewide achievements of the KCM from July 1, 2017 through June 30, 2018. The KCM would like to take this opportunity to thank you for your support of mathematics education. The dedication and commitment of teachers, administrators, collaborators, policymakers and other supporters has allowed the KCM to benefit more than 1,708 Kentucky educators who collectively experienced over 28,384 hours of the KCM professional learning over the past year. The KCM looks forward to a new year of challenges and opportunities to continue meeting the demands of improving mathematics education and greatly appreciates your continued support. If you have any questions regarding this report, please contact the KCM at kcm@nku.edu.